Are you planning to try out wealthy online dating sites? Is this the reason why you are at this Millionaire For Me review. Then you have come to the right place, continue reading below to get to know this site. In today’s day and age, dating has been made easier because of the many online dating sites today. There are a lot of online dating sites that cater to different nation and even religion. One of the popular dating sites today is Millionaire For Me. This international dating site caters to people from all over the world. If you are one of the many who’s been eyeing Millionaire For Me online dating site then the information will help you decide if this is the one for you. Millionaire For Me is an online dating site that is under the Online Millionaire Dating Category. This online dating site is somewhat new to the dating scene, but has been grabbing attention for quite some time now. The interface that is easy to use and its chic design make the website one of the best in this category. Millionaire For Me allows both men and women to find rich matches. Besides that, one of the reasons why you should join Millionaire For Me is because of the amazing features that it has. They have a live cam access, which will let you interact and see the member that you’re talking to even before meeting them up in person. Lastly, once you’re done signing up and creating your profile, you will surely start sending and receiving instant messages. 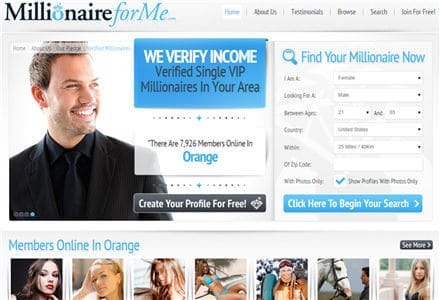 Millionaire For Me’s design is quite different from the other leading online dating site under the same category. The main goal of having this website is to connect admirers and millionaires together. In fact, millionaires are known to date people who are not as rich as them. Upon visiting the site, the homepage will provide you a clear information on the membership database of the website and of course, the ones who are online. This online dating site is not here to create statements that are baseless, because their main goal is to give you nothing but real information. Everything that you need to know are broken down into detailed pieces, so you know what you’re signing up for. You can register on the site without worrying of paying for anything. They have a basic members, which will let members create a profile. Once done they can easily browse through the site and start searching for their match. One of the best things about this is that they can post unlimited photos and as well as send and receive emails and instant messages. There is also a free video chat option if that Is what you prefer. Millionaire For Me’s sign up process is quite unique compared to other sites under this niche. There are a lot of standard questions, which will usually ask you about your hight, age, desired match, and of course your gender. You will also be required to create a description of yourself. It will also ask you something personal, like if you want to be a millionaire benefactor or one who want to be spoilt. As mentioned above, both men and women are looking for someone rich who can be their benefactor. These are all of the information that you need to know about Millionaire For Me. In this Millionaire For Me review, you sure now know what to expect. But if you want to avoid being scammed, it would be best to take extra precaution and avoid giving out too much information to anyone.